....and the mission of a small group to raise the money, in private donations, to make it possible. Follow the blog posts below to track our progress and take a look at the Proposal for more information about the Keith Floyd Memorial Project and how you could help. 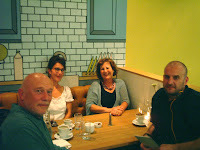 We had an enjoyable evening on the 2nd September at the restaurant in Bristol which was the original Floyd's Bistro in Princess Victoria St. It is now called the Clifton Kitchen and is excellently run by Richard Marques-Jones. What was particularly special about the evening, apart from the good food, was that we were joined by two very personable, interesting and bright young people - Poppy and Patrick Floyd. They had a wealth of information and stories to tell, leaving us, I think, knowing KF much better. We left a copy of the maquette in the restaurant for anyone to see. A further development in the Keith Floyd story is that a blue plaque is to be attached to the outside of the Clifton Kitchen, on the 23rd October at 11.15 am. to commemorate his tenure. We hope it will be well attended. A press release has been sent out to attract more interest in the project so we expect to be receiving phone calls and emails asking for more information. I have fond memories of Floyd's Bistro circa 1972/73 when I was a drama student at the Bristol Old Vic school. I remember a lovely intimate place, dark, candles on the tables, good food and wine, good company.